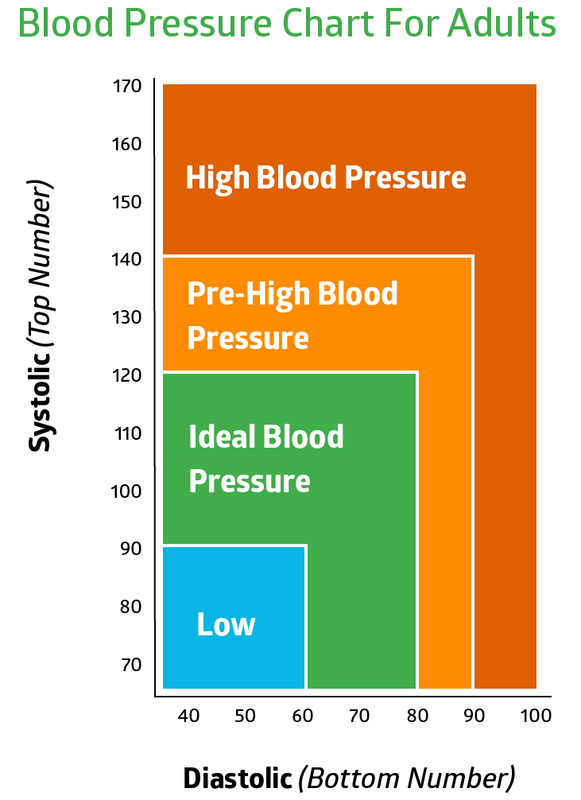 Did you know hypertension (high blood pressure) is the #1 preventable cause of premature death in the world? It’s true! See, if you have high blood pressure, the force of blood pushing against the walls of your blood vessels is too high. And your heart has to work much harder to pump blood around your body. This extra strain on your heart can eventually lead to heart disease, kidney disease, and a stroke! Recent research suggests this is a very real concern for a lot of people. In fact, over 31% of adults in the world have hypertension! Now, you may be aware of some of the culprits that raise your risk of high blood pressure. Things like stress, excess salt, excess alcohol, being overweight, and certain medications like nonsteroidal anti-inflammatory drugs (NSAIDS) and birth control medications. But there’s another risk factor for high blood pressure you might not be aware of… a lack of calcium (and a few other key nutrients.) Calcium and blood pressure are closely related, and studies show calcium supplements can regulate and potentially decrease blood pressure– even in people who have a healthy blood pressure already! Keep reading to discover exactly how calcium and blood pressure are related, and the other minerals that play a role too. Your blood pressure is the force of your blood pushing against the walls of your blood vessels as it circulates around your body. Your systolic blood pressure – This is the pressure in your blood vessels when your heart beats and pumps blood around your body. Your diastolic blood pressure – This is the pressure in your blood vessels when your heart relaxes between beats. The systolic reading will always appear first, and then your diastolic reading after. You may see it written as 120 over 90 or 120/90 for example. To gauge what your readings mean, check the chart below. Knowing your blood pressure is important. After all, it could have major implications for your health. The World Health Organization states that in some age groups, the risk of cardiovascular disease doubles for each increment of 20/10 mmHg of blood pressure, starting as low as 115/75 mmHg! Which Minerals Lower Blood Pressure? We already mentioned that calcium can lower blood pressure, but we also mentioned that there are a few other minerals involved in blood pressure too. So which minerals lower blood pressure? You know calcium is the cornerstone of bone health. But calcium’s benefits extend far beyond your bones. This super mineral provides a whole host of other benefits, including promoting weight loss, aiding dental health, and lowering blood pressure. When it comes to blood pressure, calcium plays an important role (alongside magnesium) in regulating the proper constriction and dilation (narrowing and widening) of blood vessels. Research is still ongoing, but it’s thought that this is how calcium helps control high blood pressure. 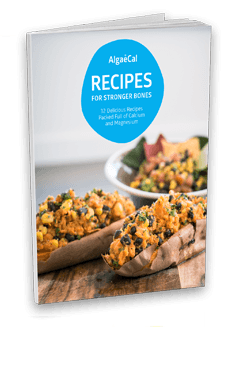 But the really exciting thing about calcium is that several clinical trials have demonstrated a relationship between increased calcium intake and both lower blood pressure and risk of hypertension. In fact, the Linus Pauling Institute– a specialized health and nutrition research institute based at the Oregon State University– reports a meta-analysis of 23 scientific studies that show calcium intake is linked to lowered blood pressure. 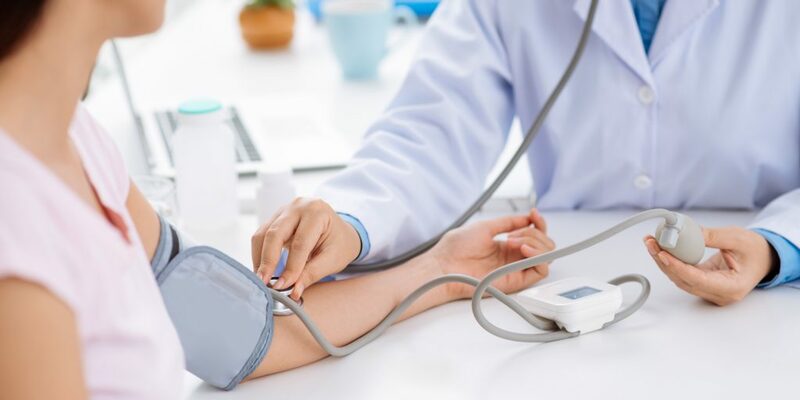 The analysis showed a 0.34 mmHg reduction in systolic blood pressure, and a 0.15 mmHg reduction in diastolic blood pressure per 100 mg of calcium consumed daily. What’s more, further research shows that when you consume over 1,000 mg of calcium a day, the effect on your blood pressure is greater. A review of 16 trials and over 3,000 participants showed that consuming at least 1,000 mg of calcium a day reduced systolic blood pressure by 1.14 mmHg. But when calcium intake was increased to 1,500 mg a day, systolic blood pressure was reduced by 2.79 mmHg. That’s why many people use calcium supplements to bump up their daily intake of calcium and reach their targets. Check out our dedicated calcium page for more information on calcium supplements, uses, benefits and more. Magnesium is a close ally of calcium, and the two work together in a whole host of functions around your entire body. Research suggests that may extend to blood pressure too. Like calcium, it’s still not 100% clear how magnesium influences blood pressure. But it’s thought that magnesium plays a role in relaxing the smooth muscle inside blood vessels. What is clear, is that magnesium helps lower blood pressure. A meta-analysis examined 22 randomized, placebo-controlled trials of magnesium supplementation and blood pressure. In total, 1,173 individuals with either a normal blood pressure or hypertension took part. The amount of magnesium taken and the length of the studies varied. But the average dose of oral magnesium supplementation was 410 mg a day, and the length of the studies was a median of 11.3 weeks. The results? Oral magnesium supplementation reduced systolic blood pressure by 2-3 mmHg and diastolic blood pressure by 3-4 mmHg. Note: a greater effect was seen at higher doses of 370 mg or more a day. Magnesium shows great promise as a key mineral for avoiding high blood pressure. But it’s important to note that the authors of the the meta-analysis we referenced here concluded that large scale, randomized trials are needed to research the effect of magnesium on blood pressure further. It’s important to mention straight off the bat that while sodium does play a role in regulating blood pressure, it’s often associated with raising blood pressure. Not lowering it. See, potassium and sodium work together to help maintain the level of fluid in your body (primarily in your kidneys) and your blood pressure too. This mechanism is often referred to as the sodium-potassium pump. But these two minerals must be properly balanced to maintain healthy levels of fluid and blood pressure. The bad news? Americans, on average, are consuming far too much sodium and not enough potassium. In fact, the average American consumes around 3,400 mg of sodium a day… far more than the recommended maximum of 2,300 mg a day! 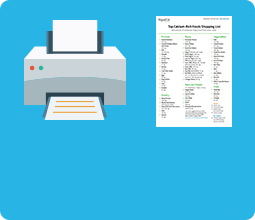 If you revisit the list of risk factors we mentioned in the intro, you’ll see excess salt. Salt is sodium chloride, which is slightly different to dietary sodium which is a mineral referred to simply as sodium. Nonetheless, one gram of salt equals 390 mg of sodium. But salt isn’t the only concern when it comes to sodium. Over 70% of an American’s sodium consumption comes from processed foods! Increasing your potassium intake, on the other hand, can help rebalance your potassium: sodium ratio and reduce your blood pressure. For a helping hand in getting more potassium in your diet, check out our “Top Potassium-Rich Foods” list. 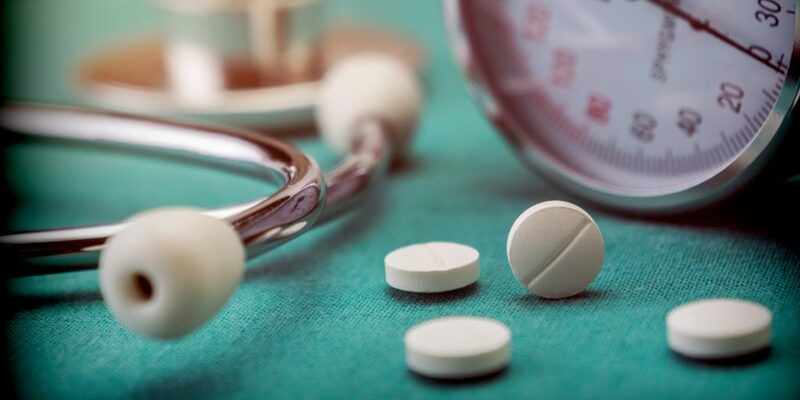 Do Calcium Supplements Interfere with Blood Pressure Medications? So, calcium supplements could help lower your blood pressure. But you may be wondering whether you can still take a calcium supplement if you’re already taking a medication to treat hypertension. Thiazide Diuretics – Thiazide diuretics are a common medication prescribed to treat hypertension. Thiazide diuretics lower blood pressure by helping your kidneys remove excess water and sodium. But taking calcium supplements while using a thiazide diuretic can disrupt how the medication works on the kidneys, which can make it less effective. What’s more, taking calcium supplements while using a thiazide diuretic can sometimes lead to milk-alkali syndrome. This condition means there’s too much calcium in your blood, and your body’s acid balance becomes more alkaline. If it’s not treated, milk-alkali syndrome can have harmful consequences. If you take a thiazide diuretic, it’s best to discuss the safe dosage and scheduling of a calcium supplement with your doctor. Calcium Channel Blockers – Calcium channel blockers help lower blood pressure by stopping calcium acting on blood vessels. If you consume a lot of calcium, a calcium channel blocker may become overwhelmed and unable to block such a high dose of calcium. But the key thing here, is that you’d have to consume an enormous amount of calcium. In fact, there’s no evidence to suggest oral supplementation has any effect on calcium channel blockers. The concern primarily revolves around intravenous application of calcium. To be on the safe side, however, it’s best to discuss calcium supplementation with your doctor if you’re taking a calcium channel blocker. You may have read fear-mongering headlines and news stories that claim calcium supplements increase the risk of cardiovascular events like a heart attack. Unfortunately, shock tactics and spectacular headlines sell better than honest, well-researched news these days. The stories were talking about a study published in The BMJ. But the important thing to note about this study, was that it didn’t take the importance of vitamin K2 and vitamin D3 into account. See, without vitamin D3, you can only absorb 10-15% of the calcium you consume. And you need vitamin K2 to activate two proteins that direct calcium away from your arteries and organs and towards your bones and teeth. Without vitamin K2, calcium could accumulate in your arteries and cause concern. You can read more about the heart attack myths surrounding calcium supplements on our “Calcium Supplements Side Effects” page. That’s why it’s important to ensure your calcium supplement contains vitamin D and vitamin K2. When you get these vitamins alongside your calcium, there’s nothing to worry about. 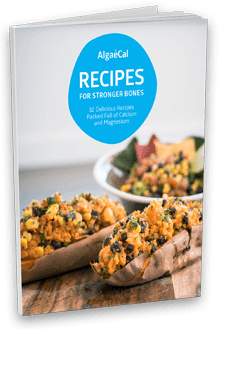 (Keep reading to discover a calcium supplement that provides all the blood pressure aids AND vitamin K2). Hypertension is the #1 preventable cause of premature death in the world. But the key part of that statistic is the word preventable. There are ways to lower your blood pressure. And one of those ways is to enlist the help of calcium, magnesium and potassium. Now, you could take three separate supplements to boost your intake of these minerals. But wouldn’t it be easier if you could get them all in one? Well, in AlgaeCal Plus you can. 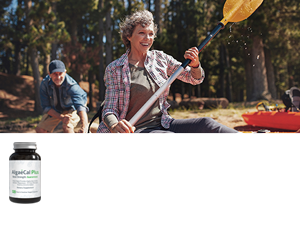 AlgaeCal Plus is a plant-based, body-friendly calcium supplement containing all three of these blood pressure aids. What’s more, it contains vitamin K2 too, so you won’t need to worry about any cardiovascular issues. In fact, there have been three human studies– the latest an award winning seven-year trial – to test the effectiveness and safety of AlgaeCal Plus. No side effects, including cardiovascular issues, were observed in any of the studies. 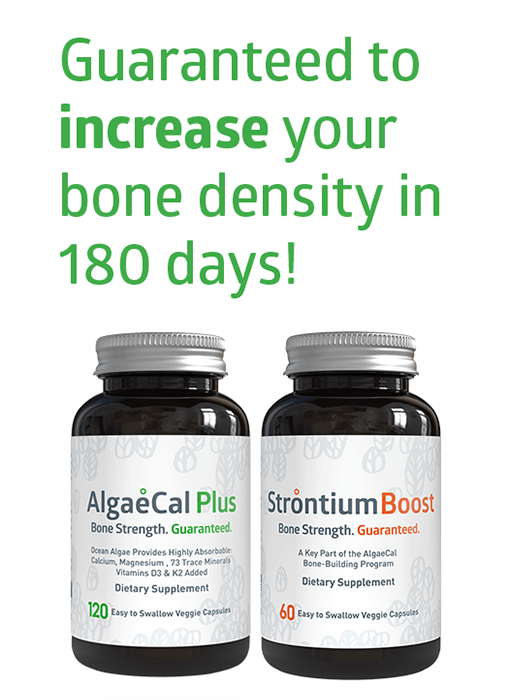 Getting your calcium from a plant-based supplement like AlgaeCal Plus has other benefits too. The plant source of AlgaeCal Plus– a very special strain of marine algae called Lithothamnion superpositum– contains calcium, magnesium, potassium and a whole host of other “helper minerals” in a nutrient matrix. 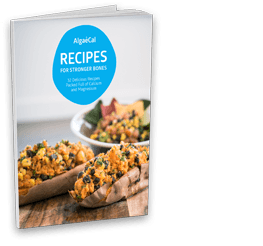 The algae uses these minerals to support its own bony structure. So when you consume them, they’re already pre-digested and ready to get to work in your body! But remember, if you’re already taking a blood pressure medication, it’s always best to talk to your doctor about any possible interactions and the best way to schedule taking a calcium supplement.